Can a 10 y.o hang himself ? 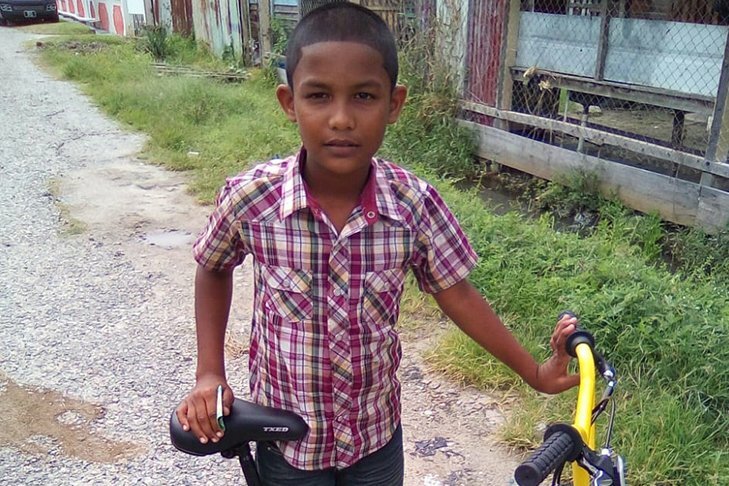 A 10-year-old boy was found hanging in his Success, East Coast Demerara house on Wednesday and his step-father was detained for questioning but later released after an autopsy confirmed that he died of asphyxiation due to hanging. Dead is Jonathan Rampersaud, a student of the La Bonne Intention Primary School. He was found hanging by a bedsheet in his bedroom around 1 pm on Wednesday in the Success house he shared with his mother, Ameena Neesha Hamid, and step-father, Balram Basdeosingh. Yes, it is passed on through culture at a young age, when pressure brace them, there are 2 recourses, poison or hanging. I once saw a sixteen year old hanged himself at Annandale. Those are the times when the pandits and Imams should get off of their seats and speak to the youth. Just heard that the step father was abusive and he is suspected of strangling the poor kid and then hang him. Jeez Bgurd. Wha de rass wrong wid u. De bai is 10 years old. What de hell he know bout hanging heself. I dont agree on this. We should say a prayer for that poor boy. It’s so sad for a kid at 10 to contemplate that. Police need to do a full investigation. I had a 12 year old school friend who committed suicide by poison. I still remember his face as I spoke to him an hour earlier. Never knew what was on his mind. Basdeosingh was held for questioning by the police after the child’s biological father, Karan Rampersaud, said that he suspected that his son was a victim of foul play. However, a police source yesterday confirmed to Stabroek News yesterday that Basdeosingh was released from custody yesterday afternoon after an autopsy performed by Government Pathologist Dr Nehaul Singh determined that the boy’s cause of death was asphyxiation due to hanging. Nonetheless, Karan yesterday continued to question the circumstances of his son’s death. “Which 10-year-old child would think of hanging himself?” the grieving father questioned. Due to his suspicions, he called for a thorough investigation of Jonathan’s death. “Suh like he (Jonathan) guh go down the drain just suh… like he nah guh get no justice,” he said. Karan explained to this newspaper that he was at work on Wednesday when he received a call from his brother, who told him about the discovery. He said he did not believe the report initially but his worst fears were confirmed when he got a second call from a cousin. As a result, Karan said he immediately rushed to his son’s home, where he saw the boy hanging. Karan explained that based on what he was told, Basdeosingh was the only other person present in the house when the boy is alleged to have hanged himself, since his mother had already left for work. According to the father, fueling his doubts that his son took his own life is the manner in which the makeshift bedsheet noose was knotted. “Me gah one strong belief me son get strangle fuss before he go up deh,” he said. “The way how the sheet tie at the neck back right… if he [Jonathan] tie it he self, the knot guh pull up fah bottom but the knot did not pull down fuh the bottom…. he can’t gah dah strength fuh pull the thing and tie it and then hang he self and the knot is a double knot,” Karan explained. Karan and Hamid have been separated for about five years and the man said he rarely saw his son. He said on Wednesday afternoon while he was at the scene he learnt that the boy was being ill-treated by his step-father. This claim was also supported by neighbours, who related that Basdeosingh would often consume alcohol and beat Jonathan. Karan recalled that on one occasion Jonathan visited his house after he was reportedly put out of the Success home. “He tell me that how he mommy put am out because them ah pressure he fah do wuk,” Karan said. The grieving father expressed regrets while stating that if he had known that his son was a victim of abuse, he would have took him into his care. Karan added that he had planned to approach Hamid and asked for the custody of Jonathan after he had gotten his life “back on track.” He said his financial situation was the main reason he could not care for the boy. “…Me seh me woulda ask the mother fuh he stay with me and me woulda try with am but look what gone and happen now,” he said. “Me nah been ah know nothing wah been a guh on or else me woulda tek he and send he school and lesson and suh,” Karan added. I dedicate this song to Jonathan Rampersaud. Leonora, thanks for posting such a heart touching song. May his soul RIP! Main na Hindu na Musalman, mujhe jeene do.